The Global Fund to Fight AIDS, Tuberculosis and Malaria (GFATM) requires the Regional Coordinating Mechanism (RCM) to have clear operational procedures and guidelines to implement the basic functions of the RCM. 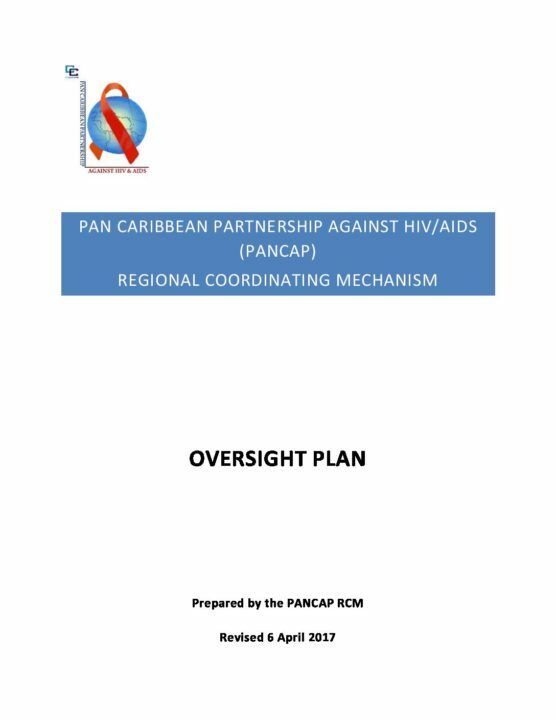 This document should serve as an operational manual defining the mechanisms that the Pan Caribbean Partnership Against HIV and AIDS (PANCAP) RCM should use while overseeing the implementation of GFATM grants. The plan defines basic principles, roles and responsibilities of the RCM members with respect to oversight functions, as well as structures proposed to carry out the oversight, technical specifications for such structures, and the tools used. The oversight plan is a framework document and should be reviewed periodically in order to make the necessary changes in accordance with the requirements, standards and recommendations of the GFATM. The Oversight Plan is approved at the RCM general meeting and is binding for all the RCM members. In addition, the RCM develops an annual oversight work plan, calendar and budget for oversight activities, which are approved at a RCM general meeting. An oversight budget is a constituent part of the overall budget submitted for approval to the GFATM Secretariat to obtain expanded funding to carry out oversight activities.